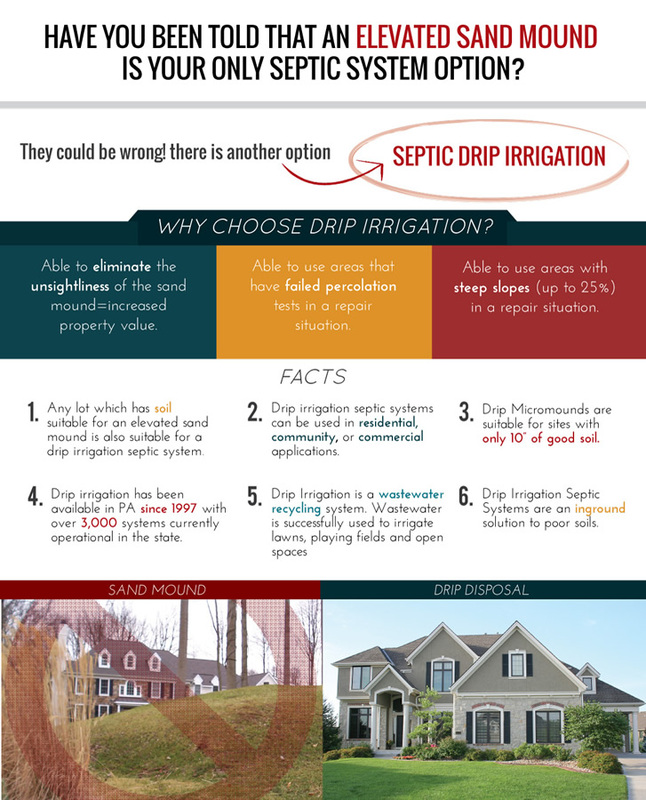 Classified by the State of Pennsylvania as an “alternative septic system”, drip dispersal septic systems are efficient and environmentally friendly. As a regional distributor, PreDoC helps with the soil testing, design, and permitting of two types of drip dispersal systems in PA, NJ, and DE. The first type of system is an in-ground drip dispersal system, which is a solution for sites with steep slopes, failed percolation tests, and wooded terrain. The second type is a drip micromound system, which is a solution for sites with an exceptionally high water table and high rock content. The PERC-RITE® brand material necessary to install these systems is manufactured by American Manufacturing Company and locally distributed by PreDoC. Although PreDoC does not install these systems, we are partnered with many regional installers who do! American PERC-RITE® Drip Dispersal has been an approved on-lot septic system in PA since 1997. As a wastewater recycling system, it places treated effluent 6”-12” in the ground, therefore irrigating the area in which it is installed. The Drip Dispersal system is an in-ground solution for sites that have steep slopes, failed percolation tests, a high water table, or heavy rock content. This type of septic system utilizes ½” diameter hosing that is plowed into the ground; therefore, there is minimal site disturbance during installation. It is found to be beneficial on wooded sites where tree removal is not needed. Before the introduction of the American PERC-RITE® Drip Dispersal system, the only options for sites with high water table and/or high rock content were an elevated sand mound, spray irrigation, or holding tanks. Now, property owners are given an in-ground solution to sites that have less than desirable soil morphology. Builders are taking advantage of this in-ground solution to help elevate property values. This micro-dosed system has a life expectancy that far exceeds a standard in-ground system. Since the system is time-dosed and micro-dosed, the soil is never saturated to the point at which the soil cannot “breathe” and becomes slime covered. Drip Dispersal Micromounds have been utilized in PA since 1999. These types of systems are typically permitted on sites with an extremely high water and/or extremely high rock content. The micromound utilizes sand to make up for the lack of good natural soil. You will find that these mounds are low profile and tend to be a total of 2-2 ½’ high. These systems are on-contour and blend in to most sites naturally. Since micromounds have been accepted as an alternate system in Pennsylvania in 2010, they have quickly become the solution for properties where there was previously no answer. 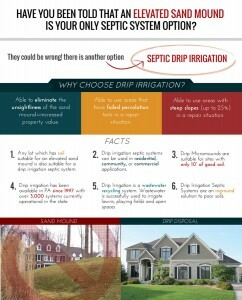 Real estate transactions that were burdened with a failing septic certification and no septic tank alternatives have now benefited from this type of system. Also, subdivisions that sat dormant due to poor soils are now taking advantage of drip micromounds.